As I was escorted onto the plane I was greeted by a guy who was standing on the jet bridge. At first I assumed he was an airport supervisor or something, given how much Air India seems to value this San Francisco flight. He introduced himself as Sandip, took my boarding pass, and escorted me to my seat, 2A. At it turns out, he was one of the senior first class crew! Within a minute the cabin crew in charge, Havanda, came by to introduce herself and welcome me aboard. I could immediately tell this would be a very different flight than my previous one. Havanda was just so nice that it couldn’t help but put a smile on my face. She had one of those smiles which warms your heart, and such a soft presence and positive attitude. Then a couple of minutes later the captain came by to add his welcome aboard as well. He was every bit as kind as Havanda and Sandip, and welcomed me aboard. 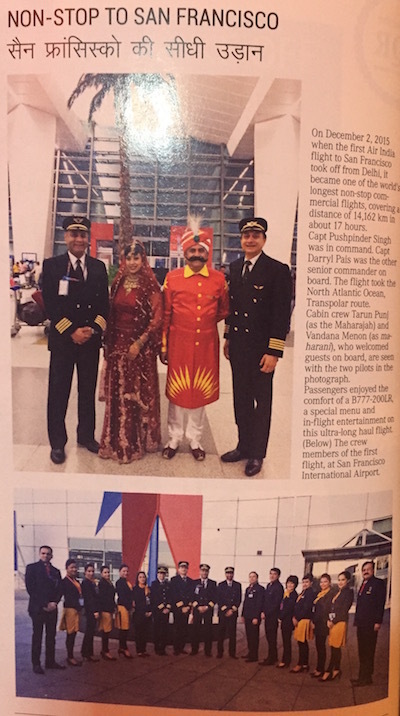 He seemed proud of this new route, and even indicated he had worked the first ever Air India flight to San Francisco (“you can see me in the inflight magazine”). He also paid compliments to the cabin crew on the flight, indicating they would take great care of me, and that I was especially lucky, since they usually worked flights for the prime minister. For some reason I wasn’t surprised! He explained the flight time, and how well this route was doing for Air India, given that every economy and business class seat was occupied. Captain Pais did the same thing for each first class passenger. Later in the flight I found out that he’s actually Air India’s general manager for customer service. Cool!! Havanda came back to my seat to offer me a drink. I requested a glass of champagne, which I was promptly served. I was also offered a variety of amenities, including pajamas, an amenity kit, slippers, and socks/eyeshades. I’m not sure what was wrong with the slippers, though they were nasty, despite being presented in packaging. 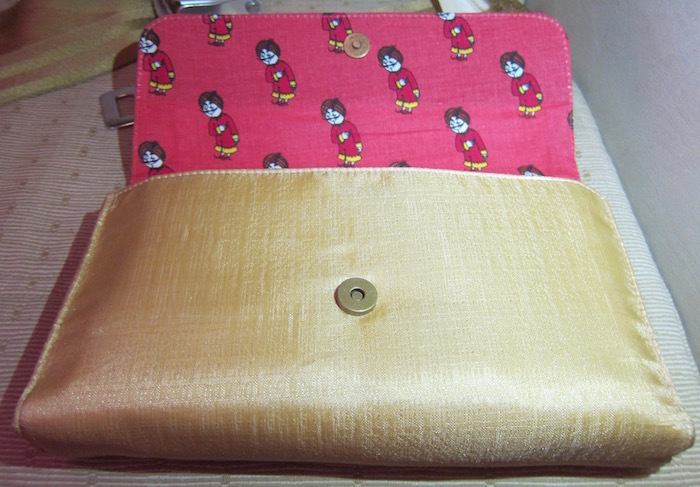 The amenity kit was sort of adorable, and had a Maharaja pattern on the inside of it. The contents of the amenity kit were simultaneously amusing and adorable. I’m not sure who came up with the amenity kit contents, but the fact that the amenity kit had a bar of soap sure was… unique. There were also eucalyptus essential oils which smelled fantastic, though I’m not sure what exactly you’re supposed to do with them on a plane. The first class cabin continued to fill up, and eventually five of the eight seats were taken. I believe at least two of the passengers were upgraded on the day of departure, given that business class was oversold. I sort of lucked out, since there were passengers in 1D, 1K, 2G, and 2K. In other words, there was no one in front of me (in 1A) or across from me (in 2D). The guy in 2G was an Indian guy who lived in Baltimore and was headed to Phoenix, as we chatted a bit in the lounge. The guy in 1D was someone famous I sort of recognized, but I couldn’t figure out who he was. He did yoga during the flight in the aisle. 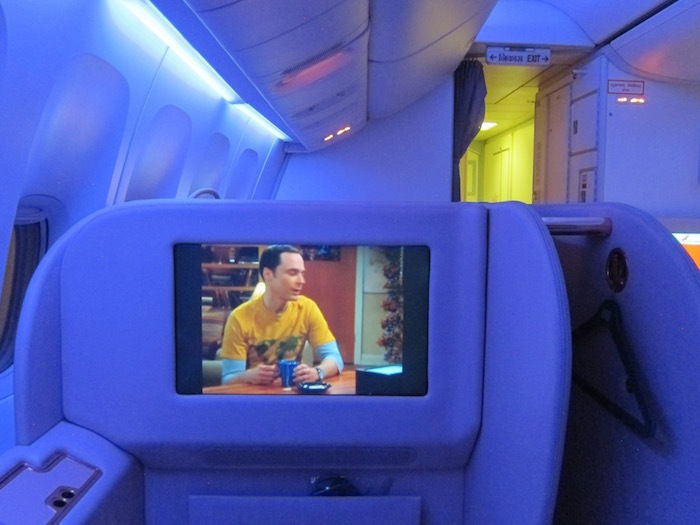 On this flight the entertainment system was turned on while still on the ground (on the previous flight it was only turned on after takeoff), so I watched an episode of Big Bang Theory. At 2:45AM the main cabin door closed. Havanda came on the PA to welcome us aboard our 16hr5min flight to San Francisco. Yow, that’s a long flight without wifi! At that point she screened the safety video. Unfortunately we didn’t start our pushback, and it quickly became apparent why — the weather was deteriorating rapidly, and visibility was next to zero. At this point Captain Kapur (the other captain) came on the PA to inform us of our indefinite delay due to fog, explaining that no planes were departing, and that we’d get underway as soon as the weather improved. At this point Sandip came by to explain the service on the flight. I found the order of meals on this flight interesting. So on a 16 hour flight you’re simply served a light snack after takeoff, then breakfast halfway through the flight, then lunch before your early morning landing in San Francisco. The meals are clearly based on Delhi time as opposed to San Francisco time. Alrighty then! During our delay the jet bridge was pulled back up to the plane again, and then at around 3:25AM the door was closed again. 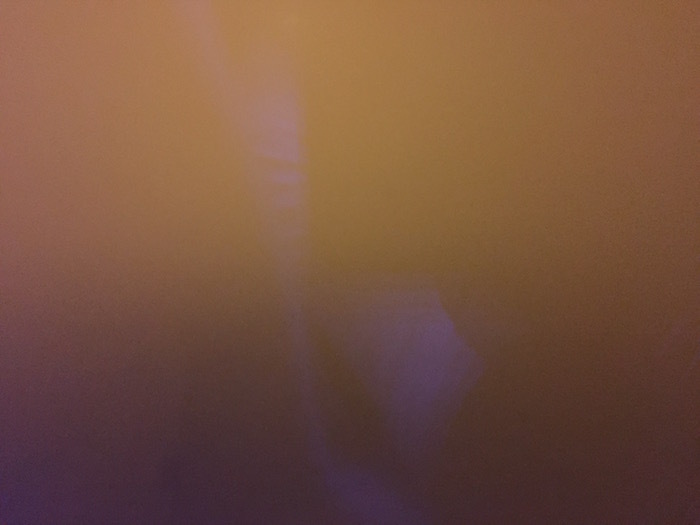 At this point the entire cabin was fumigated, which is the first time I’ve experienced that before takeoff (usually it’s right before landing, in my experience). At 3:35AM we finally pushed back, and I was a bit confused, because the fog was the worst it had been the whole time. I couldn’t even see anything out of the window. A few minutes later we began a really slow taxi (presumably due to the limited visibility). As we taxied out I noticed that most passengers in business class were already reclined and sleeping. After a 30 minute taxi we made it to the departure runway, where visibility was ever-so-slightly better, but still extremely limited. Without delay we began our takeoff roll, and were airborne at 4:10AM. 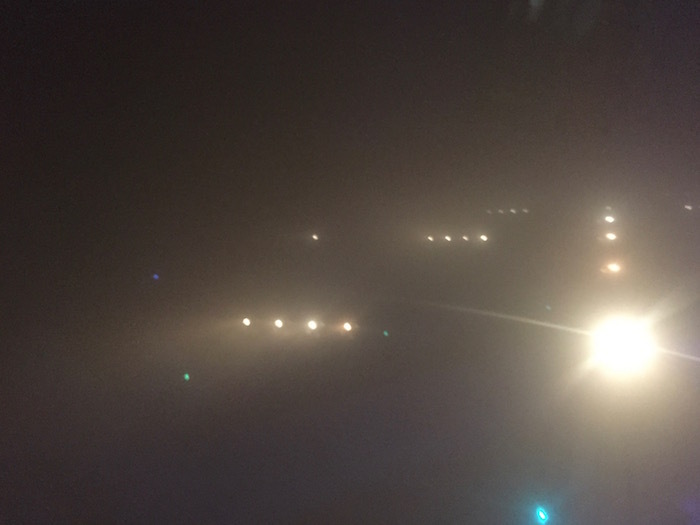 Less than 30 seconds after takeoff it was a clear night above Delhi, so the fog was only at low altitudes. Later in the flight I had the chance to speak to the captain again, and asked him about our departure. He basically explained that he figured we’d begin taxiing to the runway, in hopes of the weather improving slightly and us then being among the first planes to takeoff, given that there would otherwise be huge traffic delays. Apparently we lucked out and the minimum visibility of 125m appeared right as we got to the runway, so we could take off. Our climb out was smooth, and 10 minutes after takeoff the seatbelt sign was turned off. Another 10 minutes after that the cabin lights were turned all the way on. I was a bit surprised by that, given that most passengers were sleeping. At this point tablecloths were placed out on the tray tables. Havanda appeared within a few minutes to bring two small plates, silverware, and a glass of champagne. Interestingly the silverware was in a sealed ziploc bag. After that Sandip came around with some aluminum tins with a couple of choices of food, including chicken and shrimp. I requested a couple of each, and figured that was it for the snack. It was certainly a filling snack, and in many ways hit the spot, since most passengers were ready to sleep at this point. I asked for my bed to be made, which Havanda took care of in a matter of minutes. 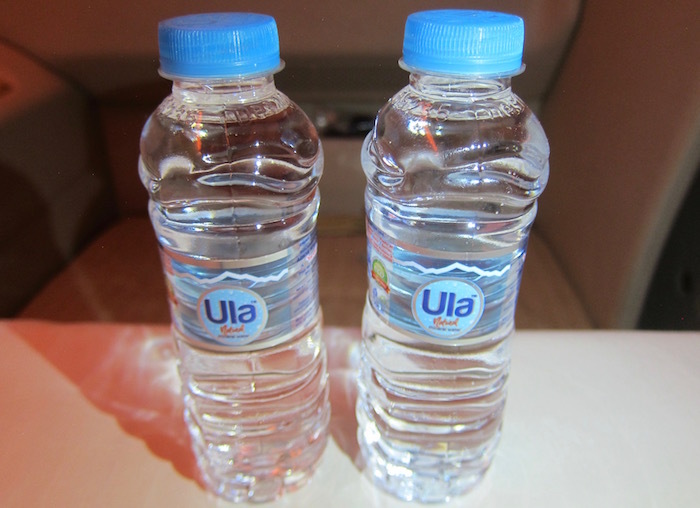 She also placed two bottles of water by my seat. While she made the bed I headed to the lavatory to change, and saw the nice selection of amenities they had on offer, including toothbrushes which still had price tags on them. 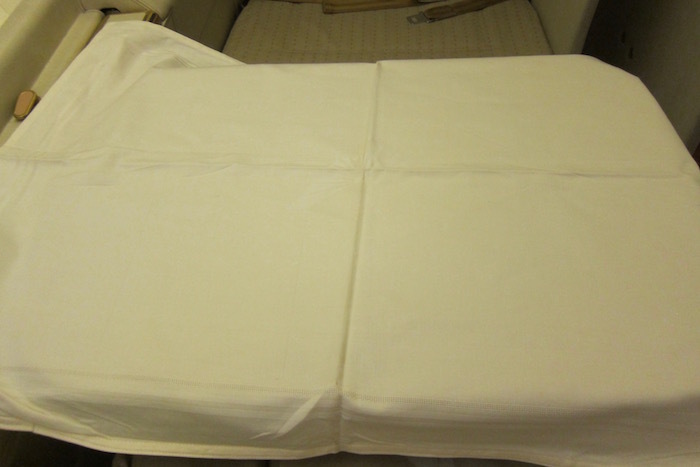 Much like on the last flight, the seat itself was rather lumpy and there was no mattress pad, but rather just a sheet placed on the seat. As a result, it wasn’t the most comfortable sleeping surface. Still, I was extremely tired given what a long day (and week!) it had been, and fell asleep in no time. I woke up feeling quite well rested, thinking we were approaching the halfway point in the journey. I turned on the airshow, only to realize we had 12 hours left to San Francisco. Given that there was no wifi and entertainment choices were limited, I decided to get some work done on my laptop. I made a lot of progress on this trip report. Not to be creepy by noticing how other people sleep, but my gosh the guy across from me slept in the creepiest way I’ve ever seen. He must have gone out of his way to look like a mummy while he was sleeping. His head was elevated and he crossed his arms across his chest. Worst of all, he had his reading light on the entire time he was sleeping, so his face was lit, as if he was some sort of an artifact in an ancient Egyptian museum. I asked Sandip when breakfast would be served, and he explained it would be in a couple of hours, and that he was trying to “buy time,” given the long flight time and that they only had two meals to serve. 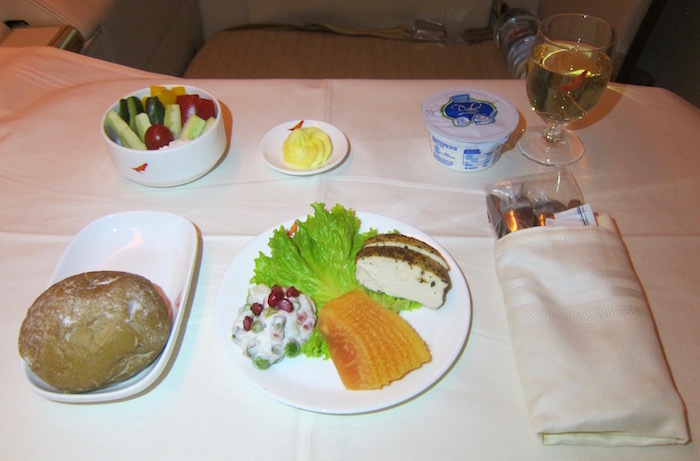 On longhaul flights other airlines have a huge dine on demand menu, where you can eat what you want when you want. In the case of Air India the meal service was pretty structured, so they were trying to draw out the second meal so that people wouldn’t get too hungry waiting for the last meal. I also ordered a coffee to accompany it. I really can’t emphasize enough how kind and genuine this crew was. On my last flight the crew didn’t come through the cabin once to check on me, while on this flight Havanda and Sandip must have been walking through the cabin every 15 minutes to see if anyone wanted anything, despite it being the middle of the night. Seven hours into the flight, at around 11AM in Delhi, the captain came on the PA to give us an update on the flight, informing us we’d be landing at around 7AM, an hour behind schedule. At this point the cabin lights were turned up again, and breakfast service began. 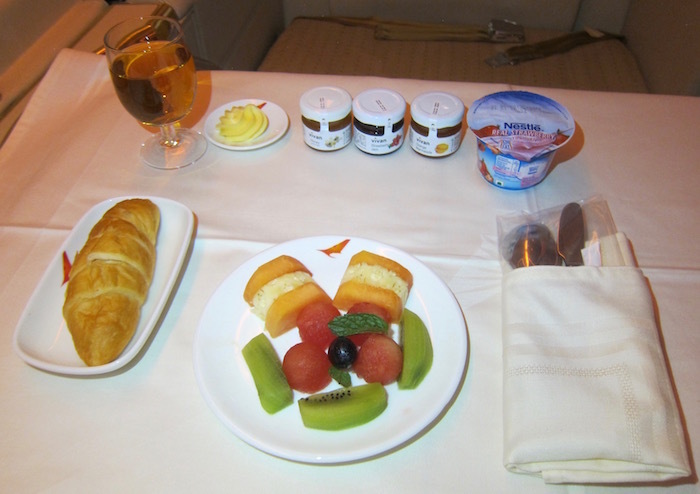 The breakfast starter consisted of strawberry yogurt, a fruit plate, and a croissant. For the main course I asked for whatever Indian vegetarian food they recommended, and it didn’t disappoint. It was delicious. After the meal I came to the realization we had about eight hours left to San Francisco. This absolutely felt like the longest flight of my life, by far… much longer than comparable flights from Los Angeles to Dubai, Abu Dhabi to Los Angeles, Dallas to Hong Kong, etc. The lack of wifi, amenities, and decent entertainment sure drew things out. I wasn’t really tired, so I kept working on my laptop for a bit longer. After working for several more hours I was getting pretty desperate, so decided to watch some episodes of Modern Family I had already seen. I don’t know why, but I struggled so much to sleep. I guess my mind was just wandering with the whirlwind few days I had. Fortunately I finally managed to fall asleep about three hours before landing, and slept for about 75 minutes, until lunch service began. While it was only a short nap, it made me feel quite refreshed. At this point we were over Canada. Again, it’s quite interesting that Air India bases meal times on Delhi time rather than the time at your destination, given that it was 4AM in San Francisco at this point, and we were eating lunch. 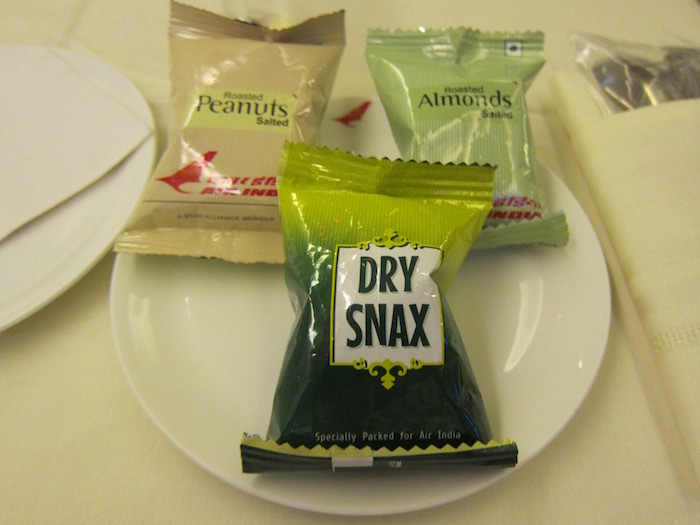 To start I was served the “hors d’oeuvre,” which was almost as puzzling as on the London to Delhi flight. I’d rather have some decent Indian food than a bland piece of chicken. The starter was served with a side of tasty veggies. There was also a bread plate, consisting of some wheat and garlic bread. 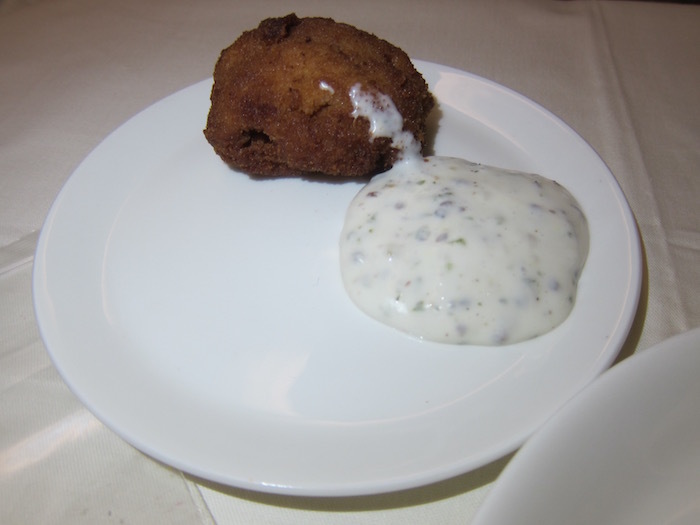 Next I had the saffron & almond shorba, which was delicious. And then the buffet lunch commenced, where Havanda and Sandip rolled a cart through the aisle off of which I could choose. While the presentation left a bit to be desired (not on the part of the crew, but rather on the part of management in terms of what they’re giving staff to work with), everything looked delicious. And here’s the lovely Havanda serving the meal. The amazing Havanda looking great after 14 hours of flying! I asked for one plate with everything vegetarian, which was an eclectic mix, to put it lightly. It’s not every day you get spinach cannelloni on the same plate as an Indian smorgasbord. After that the dessert cart was rolled through the aisle, consisting of fresh fruit, boxed chocolates, cake, and a cheese board. I asked for a small cheese board and also a slice of cake. The cake was tasty. 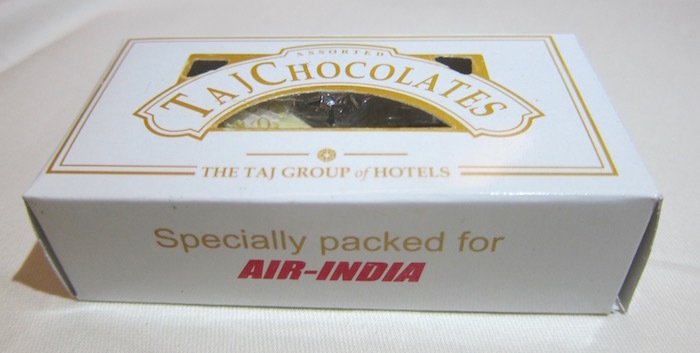 I was also offered some Taj chocolates after the meal. To finish off the meal and get my day started I also had a cup of tea. Soon enough we were approaching the descent stage of our flight. Captain Pais once again came through the cabin to say hello to passengers. He was a true class act. Soon enough we began our descent into the Bay Area, where I witnessed a very slow and gorgeous sunrise as we descended. There’s nothing quite like a gorgeous sunrise while flying. We touched down on runway 28R at 6:40AM, and then had a quick five minute taxi to the gate. I bid farewell to Havanda and Sandip and thanked them for the great service, though was also excited to be on my way after 30 hours with Air India. There was a bit of commotion as I deplaned, but from there I was through customs in a matter of minutes thanks to Global Entry. 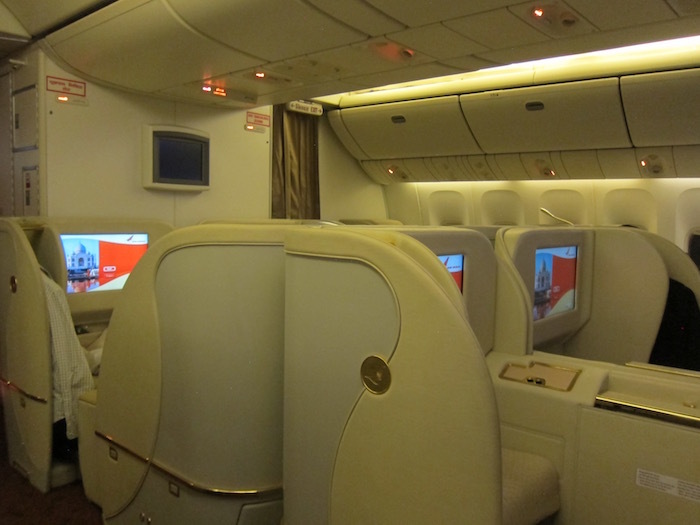 When I first booked my ticket in Air India first class, this flight was what I was expecting as the best case scenario. I was expecting an aged and worn product with lackluster entertainment. And I got that. I was expecting a non-globally competitive product in terms of how the meal service worked (no dine on demand menu, etc. ), and not especially well planned out processes. And I got that. 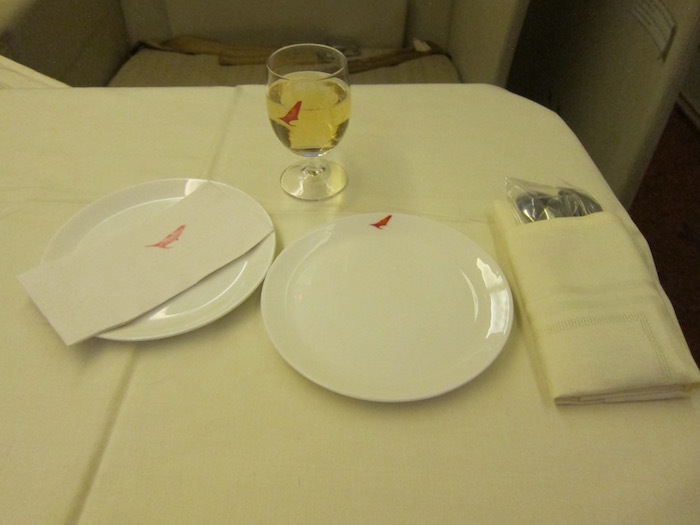 So, would I recommend Air India first class? It’s not going to be competitive with the world’s best first class products, but it’s also not actively unpleasant in any way. I felt safe at all times, the product is comfortable enough, and if you get a good crew, you’ll feel really special. The ground experience in Delhi is downright impressive. If they were the most convenient or practical option, I wouldn’t hesitate to fly with Air India again. 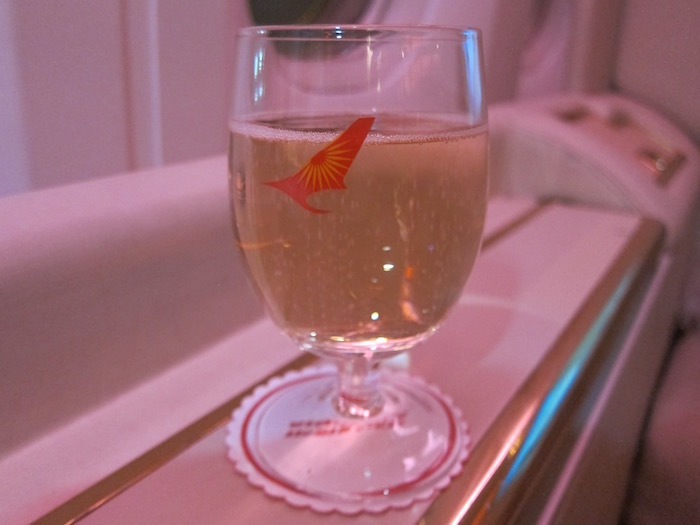 Would YOU consider flying Air India first class? Amazing trip report. There’s usually plenty of fog in the wintertime in North India because it moves Northwards towards the Himalayas from the Indian Ocean, but can’t pass over the mountains because they’re so high (rain shadow effect and everything), so instead of being deflected into Tibet the fog surges straight back into the plains of N.I. At least it made for a fascinating takeoff…. Nice review, Lucky Charms! Finnair new A350s look much nicer, but Indian hospitality looks great too. Indeed, AI’s competitors EY and QR have dine-on-demand even in J. Re the menu, there’s no way to win that one. You can’t start serving food based on SF time either. A ‘snack’ at 4am seems reasonable. 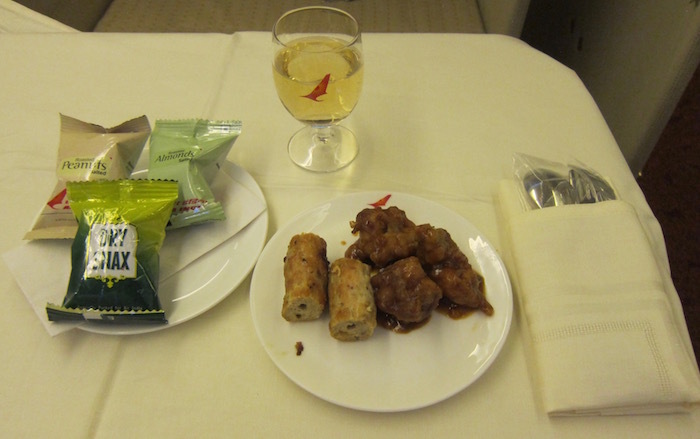 Lunch before landing is less reasonable, but I’ve been served inappropriate meals on other carriers as well. But DOD is best for allowing each passenger to design his/her own meals. 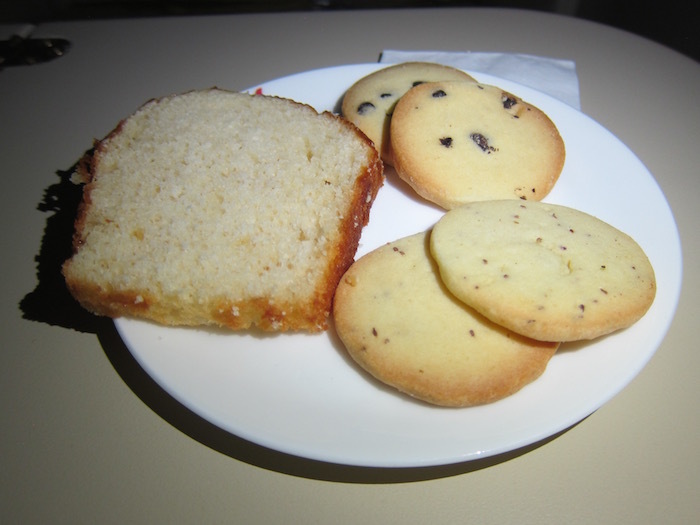 Example of inappropriate meal: breakfast served on CX before 2pm landing in Chicago. I agree with your bottom line — AI really can be good when they try! If I needed to make a quick trip to India, this report has convinced me to try them out long-haul! It’s unfortunate that the management can’t keep up with industry standards and that it’s left to cabin crew like this to make up for it. Almost the opposite of airlines here, where the hard product can be great but crew don’t care to provide good service. The food situation is interesting, I remember Etihad having problems with running out of food on AUH-LAX and Emirates running out of drinking water on DXB-LAX, perhaps it’s in the Indian mindset to save food for later on such a long route rather than run out at the end. Those menus made me hungry. I love that you focused on what was good. If every airline was exactly the same we wouldn’t have this much fun. It seems like they made an effort to provide good service and you had a comfortable flight. I would try Air India for sure, It can get a bit boring flying Jet Airways, BA & VS from India to the UK all the time. I would probably pass the business class and go for the first. What is amusing is they did not seem to care about people having their seats reclined and being asleep before take off, i can’t imagine a US run airline allowing that. The food looked good, and I think what matters more here on this trip report , is yes the first class product can’t be compared to Emirates, Etihad etc, but you got a fantastic service and that really can make or break a flight, even if you did or did not get special treatment if they knew you were a blogger it does not matter. Overall a wonderful and detailed trip report, thanks Ben. I would say this is one of your best trip reports ..but unfortunately there is something missing – photo of the mummy guy lol ..
enjoyed the report a lot ! Desserts look much better than main meals, thanks for great review. I feel you have captured the essence of the airline very well. You should introduce the concept of QPR – Quality to Price Ratio – for your flight reviews! SFO-DEL-SFO is about $8,000 in AI FC, and $16,000 in CX F via HKG. If one is redeeming miles and you want to maximize your return, I’d pick CX any day. If I’m paying out of my own pocket, what you are saying is that AI is a pretty decent way to fly there (and back). ” don’t know why, but I struggled so much to sleep.” LOL!!!! Look at the menu. Although Indian food is amazing, it is not the typical meal I would eat before going to sleep. First, I appreciate the reports. The level of detail and the speed at which you posted them. That said, and I understand your positive spin, but let’s get real. On both flights, the seat wasn’t comfortable for sleeping. The IFE wasn’t great. And the food was average at best. We can agree to disagree on what “actively unpleasant” means when you have a bed that’s lumpy on 28 hours worth of flights. On one, you had great service. On the other, you didn’t. I’m not sure how that adds up to a positive recommendation. @lucky It must be a policy to fumigate during departure from India as EY did the same which was a shock to me. Off topic, but also shocking to me is that once you enter the departures terminal on DEL (before even checking in), you are not allowed to leave. They have military at all doors preventing anyone from leaving. I made the mistake of showing up 6 hours before a flight connecting from the domestic terminal to the international terminal to drop luggage off and then head to the city for the day but instead spent 6 hours locked inside! We’ll be going to India in September, and would prefer a nonstop from the US to get there. It’s a strong contender. This is to subscribe for the comments. “What is amusing is they did not seem to care about people having their seats reclined and being asleep before take off,…” They don’t appear to care if people are wearing seat belts on takeoff either. You left out the most important bit: what Champagne was served? @Lucky — where do you place AI first viz. a viz. the same on AA or DL or UA? The picture you have of Havanda makes her look like Miranda Sings. Great trip report, thank you as always, loved reading it. I think the method of food service is cultural to southeast Asia. 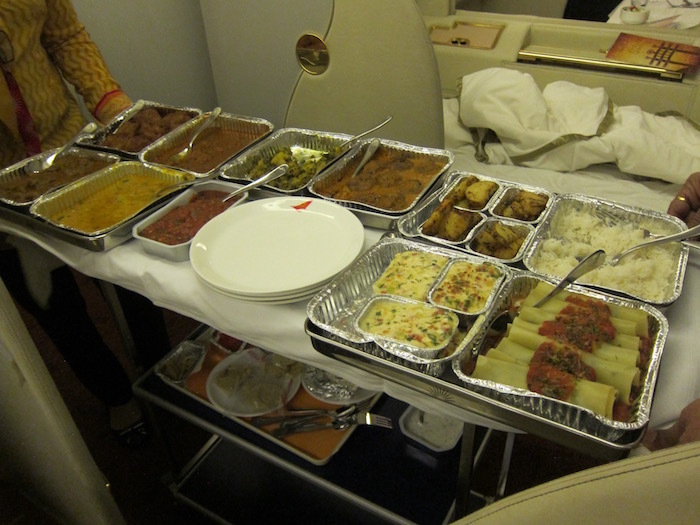 The Pakistan flag carrier also serves ethnic food from the aluminum trays. Does Air India give a Western option at the time of reservation? 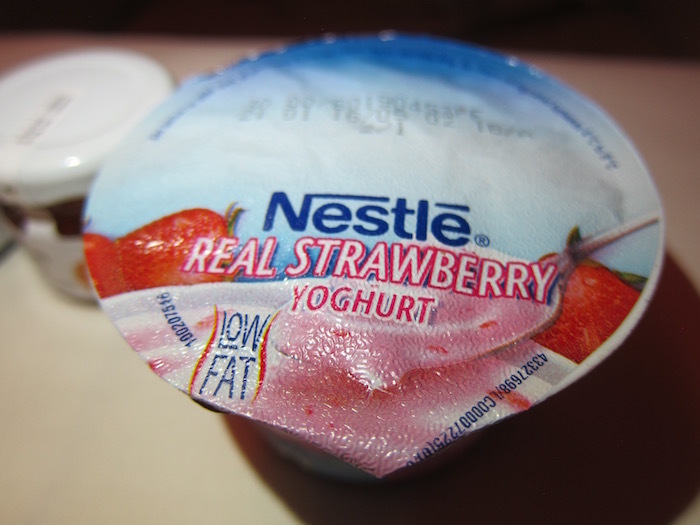 I would be cautious about flying them because other than the yogurt at breakfast, there wasnt much that this strict nothing fried, no bread, pescartarian eater could consume on a nearly 17-hour flight. @ Jay — I’d probably put US carriers in the same class of service ahead of Air India, all things considered. Good on you for trying out AI F! As much as we’re all looking forward to another CX F report – hah! Incredible that even AI can serve delicious food onboard, but AA can barely serve an edible piece of chicken. Pathetic! Lucky, really a great trip report! I love this entire series. The trip must have been amazing, thank you for taking us along! By the way, how tall are you? Would be good to know for comparison when you say you couldn’t fully stretch out on AI First. My flight experiences have been quite similar in the past (although from ORD), and my amenity kit contained chocolate and mints instead of a bar of soap. The toiletries are actually organic. I have made similar journeys on AA (non codeshare) and UA F before. Personally, I would recommend AI more – especially since the food is actually edible and the service warm. I also find the seats to be more comfy, partially because they are so worn out. As I mentioned in earlier posts, they go all out when you fly with them thirty times a year. It’s my favorite way to get to and from India especially compared to the other direct options consisting of UA and AA. I’ve actually had the same crew on several flights before and can consent that they are consistently warm, sincere, and smiling. Only one thing to add. Don’t make the mistake I made on my first journey to DEL. You need to have your airline reservation with you and do not sure more than five/six hours realist than your flight because you are not allowed into the airport by security. Also do not disobey the commandos as one unfortunate non-Indian did when I flew last year because you will be cuffed and escorted away. Security personnel are strict and grim at DEL since the airport is always on high alert. 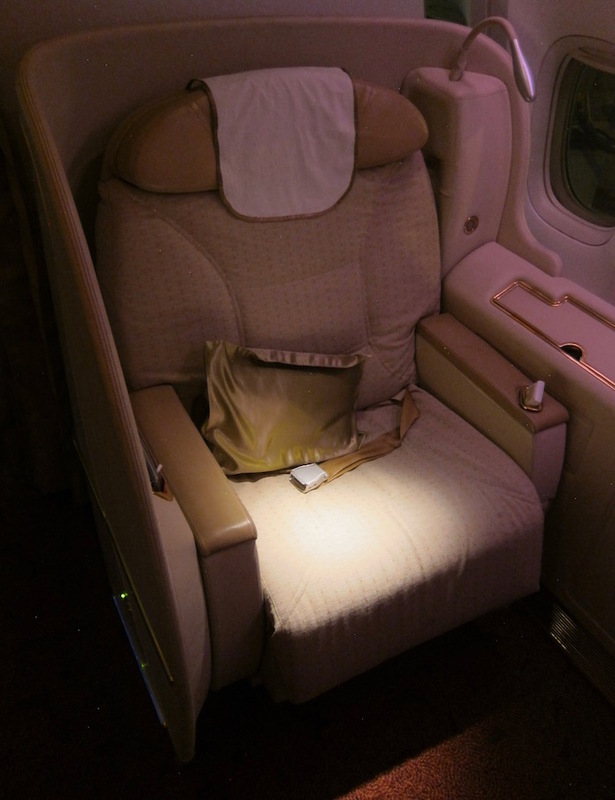 The Business Class seats actually look quite close to flat-bed? At they appear not as angled as I would have thought. So much about India’s consumer facing businesses falls into the same category. It’s as though there’s an understanding of the wider world, but not a great deal of first hand experience. So many things appear to be done in a way that was planned by someone who had a world class experience described to them (without pictures) by someone. Once. Lucky – I do hope that you share the trip report directly to the airline. The risk otherwise is that Air India will ask a consulting firm to do research as to what they can improve, and after months and thousands of dollars, will receive your trip report plagiarized and returned back to the executive team. Given your sites high ranking on Google, I’m hoping they’d find it before the consultant willing to bilk them for your work! 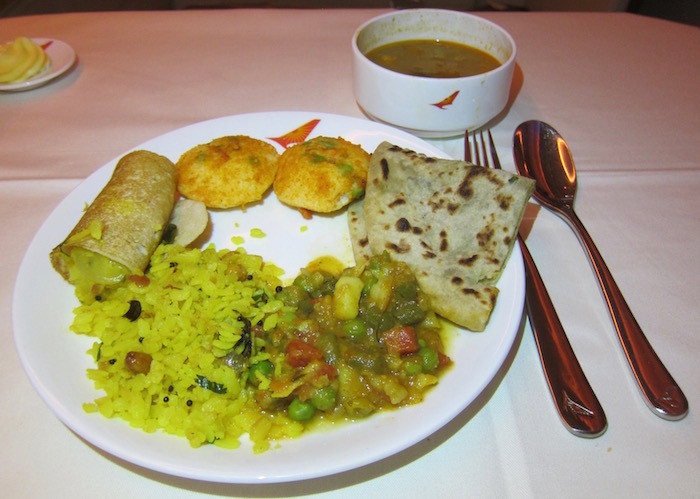 My most memorable flight was actually in 1997 from Rome to Mumbai via Abu Dhabi in Maharaja class on AI – we actually got fed 8 times during that journey; I was a happy and plump passenger and the food awesome. BTW, just out of interest, I saw your link to the Dallas-Hong Kong trip report linked to this page. Man, the food on that report looked atrocious. I definitely prefer the options here. Another thing, my wife works as a head stewardess on an Asian airline – the method of serving food in aluminum trays might become more prevalent since it allows the food to heat up more evenly and enables quicker service to the passengers. It not only works well for Indian food, but anything from South East Asia as well. With regard to the appropriateness of meal times, if I was feeling fussy and wanting to stick with what my body is telling me, on looking at the big variety of what was on offer, I could pick and choose to structure a meal approximating the meal the body is expecting. As an aside, I note that Lucky avoided rice with his Indian main dishes. To my mind this diminishes the Indian meal experience totally. Maybe this is an American-centric thing? @K, let’s not blame just the winter for fog. It has more to do with Delhi’s atrocious air quality and levels of pollution. There’s a sadness and loneliness in all this. I pray you find some happiness someday. Did Havanda authorize you to use her picture? Just curious. You used it in your previous report and many commenters posted insulting jabs at that woman. You moderate the comments so not sure why you allowed those to be posted. Poor woman. She was just trying to do her job with a bit of aplomb and your and your minion insulted her for……….existing? If you aren’t the epitome of a typical (gay) bully, I don’t know who is. Nice review as always Lucky! 1. 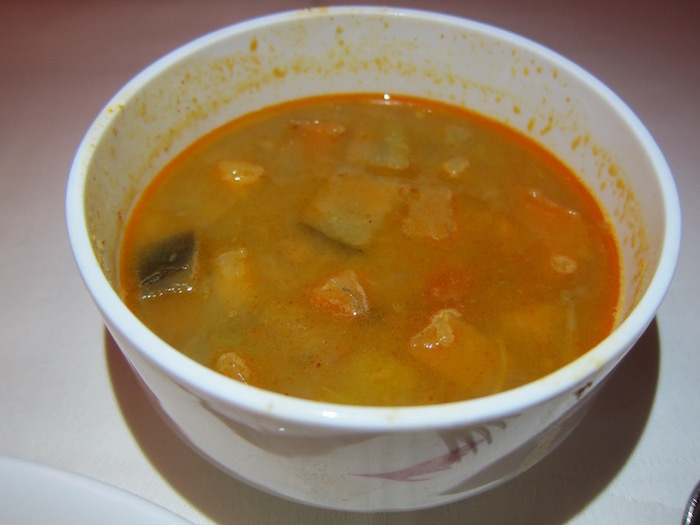 Sambar (soupy stew with veggies) to go with Idlis (round cakes) and Dosa (crepe)in breakfast looks more reasonable and appetizing compared to the “curry” you had on the outbound. 3. The appetizers were quite a fare and best part of the dining.. if you go to dives outside Delhi on the highways.. you do BYOB from adjoining liquor shop.. and order endless rounds of finger food followed by a little bit of naan and some daal to wrap up. I go to India to eat this type of stuff, not your traditional meals..
4. I am still scratching my head to figure out the name Havanda, never heard it before..hope i did not offend anyone. 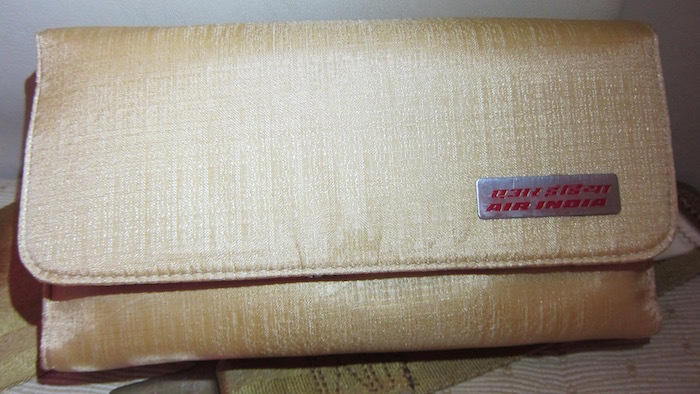 Nothing shoddy with the amenity kit’s contents as the company “khadi” does make products of homemade quality. @Lucky – Great report! What was the wine selection like? Did they even have a wine list? So overall, your reviews seem to sum up AI pretty well. Decent but not great hard product, hit or miss service, good food, good ground services in India, average lounges, and average entertainment system. Havanda does seem like a great FA (though I would say she should tie her hair while serving food), so good thing you lucked out on that. AI does have potential, but given the choice, I think I’d choose Jet Airways. Better seats, and the service is consistently better overall. Looks like you had a good journey, Lucky. I totally agree with you that they need to make the bed better, and improve IFE and offer wifi. No question about it. Other differences you mentioned are due to culture, and I don’t think AI should change those. You’re used to uniform European and American carriers who do things one way. Indians do things another way, and there is no evidence that shows European ways are ‘better’. You’re just accustomed to it. Displaying food before serving I actually prefer, coz I can pick what I want, rather than be disappointed with what’s placed in front of me. Placing cutlery in plastic means no one touched it before. Other airlines should be doing it too, if you ask me. And labeling meals is inconsequential. Call it breakfast or lunch or whatever, as long as you’re well fed, what does it matter? Again, you’re just comparing it to what Lufthansa or Cathay do (naming meal according to departure or arrival time zone). Ultimately it’s confusing to the body to travel through so many time zones, no matter what your mind thinks it’s eating when. That amenity kit looks amazing, not sure why you found it weird? It doesn’t look like what AA or BA hand out, so what? And looks like they are supporting a cottage industry with those products. If you ask me, more airlines should do it, and direct revenue to people who need it, instead of using yet another fat-cat multinational cosmetic maker or brand. People who are rich enough to fly F aren’t looking for 0.5oz samples. Glad the crew were amazing. Btw, did you get the lady FA’s permission to post that pic? You’ve also named her, so I hope she okayed the photo. If that were my mom and someone posted without her permission, I’d sue the pants off whoever did it! Hope you can spend some time out of the airport if you ever decide to visit India again! 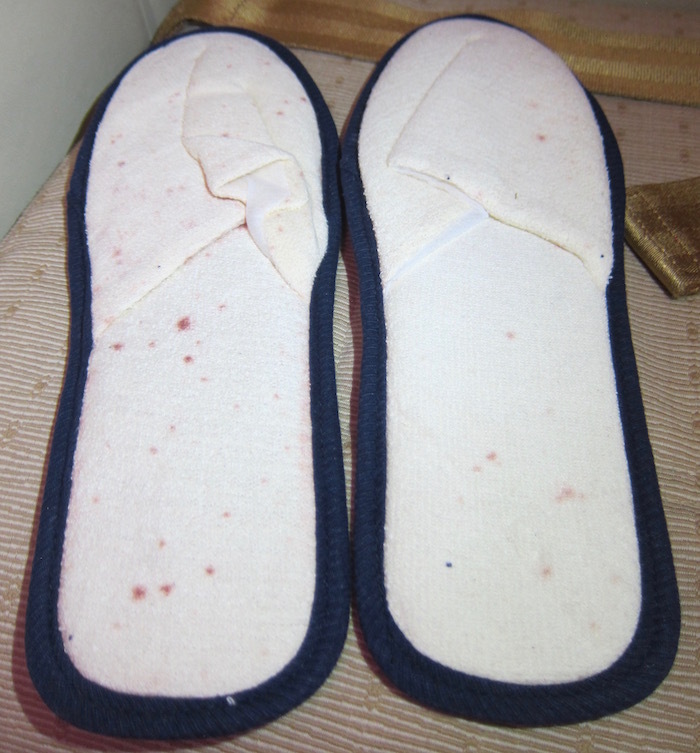 The slippers are made of khadi, a handwoven cotton cloth. The cloth can be more expensive than handwoven products and don’t use chemical bleaches or dyes. That would explain the way they look. I find it extremely surprising that people were left sleeping with their seats reclined for take-off. Thanks for taking one for the team Lucky, I was never going to fly them, but you have now made sure I will not. How were these guys allowed into *A? Weird, I was almost sure this would be an eastbound flight (northish – northeast to be exact). 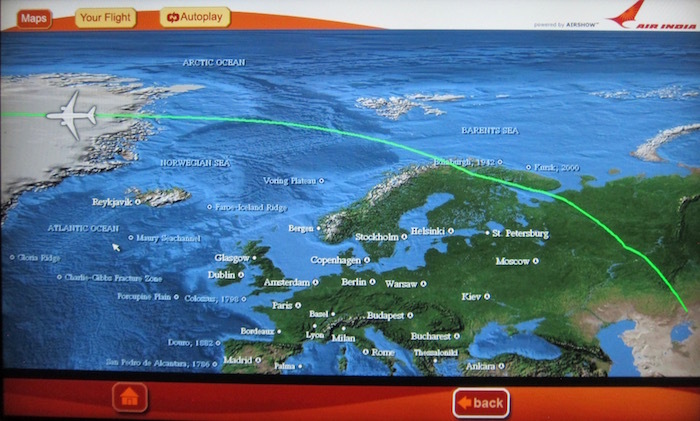 Still your IFE/Airshow photos and flightradar24.com show that they fly this as a clearly west- or northwestbound. 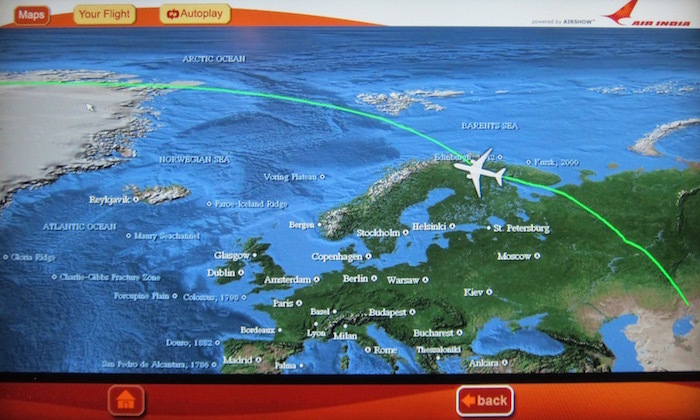 Not really even close to northbound as they fly across Finland! It surely would be shorter to go over Russian Far East, East Siberian Sea and the Bering Strait, as an northbound but on the eastern side… Maybe the winds have something to do with this? Amenity Kit: Products are handmade with all organic and natural materials. Sure they are not shiny as chemical based products in nice package, but they are priceless. Save them. @john, What makes others great members of *A.
UA has the worst in service and LH need a separate time table of industrial actions. AC and SQ embracing AI and getting rewarded in a growing market while UA and LH living in the past still thinking they are the leaders. AI should learn to demand what it paid for. IFE content RFP clearly states at least 10 Hollywood movies should be less than six months from release date. There is no reason why AI cannot enforce contract terms. There is no reason why it cannot keep upholstery clean and seats cushy. I wouldn’t compare AI to the US carriers (its a weak sauce argument, I mean, really)…better to compare it to the likes of ANA, SQ, Asianna, etc. You know, good airlines. The best option is to give passengers dine on demand. It isn’t a question of what it’s called, it is what is actually served. Let people who want breakfast have breakfast, those who want snacks can have snacks, etc. I’ve flown AI before, but its all been within India (BOM-GOI, DEL-SXR) and the planes in those cases had as much duct tape in the interior as I have ever seen. Being said, it sounds like their longhaul product seems much better taken care of than their A320 fleet. Given the difficulty in finding saver availability on flights to India in the past, I’ll definitely give AI a chance based on these reports as flying direct to BOM or DEL is a very nice option to have. How was the soup? 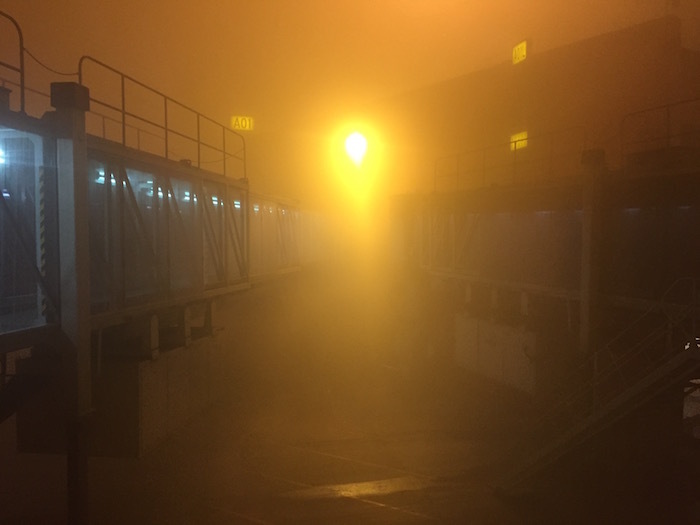 Oh wait…that was the fog. I will concede that it is not the best hard product in the world, but my flights on AI have been generally pleasant, particularly due to the service. My choices for travel to India (mainly for business but sometimes for pleasure too) are quite limited since I don’t have the time to spend on connections and the alternative direct flights are UA and AA. Compared to them, AI is a clear winner. They are very attentive to Solitaire PPS Club members such as my husband so we appreciate the care and attention. I agree with WWKD5 above. Lucky, the F hard. Product looks very similar to a J seat. The food variety is extensive. Unless Indians and expats sample it, difficult to talk about quality. as said earlier hundreds of thousands of small shops, hawkers etc provide very tasty fare. It looks like the hard product was chosen long before the new chief took over. A pity. I was all set to give AI a third chance after your earlier ground experience, but now I have to reconsider. I was responding to the question Why AI was allowed into *A. Question is why still in UA in *A. If UA was not in JV bed with LH and partnered with AI (and other Indian carriers) ME3 wouldn’t have captured entire US-India market. Now there is no point in US3 crying like a babies for losing the farm, they are the ones who bet on EU3 and put down Indian carriers, ME3 stole their lunch. Can ANA serve a good Indian meal??? Answer is NO. ANA may serve best sushi and world class champaign/wine, lot of latest hollywood movies, but how does it help a non-drinking, vegetarian Indian passenger with limited English, bulk of AI passengers. I wonder if DEL should be the first airport to upgrade to the ILS CATIIIc instead of their ILS CATIIIb. But again, I don’t know how comfortable I would feel about landing in 0/0 visibility. Food is great outbound from India since TajSATS do make really flavorful dishes (by no means good ole home cooking, (my wife is Indian), but more of the rich and heavy meals one would expect at a restaurant). I have had hit and miss experiences with catering from outstations. I also call in (they have a special customer service number for F passengers) and request certain dishes outbound from places like ORD to be sure I know what I am getting and they usually accommodate – kinda similar to book the cook on SQ but unlimited in options as long as within reason. 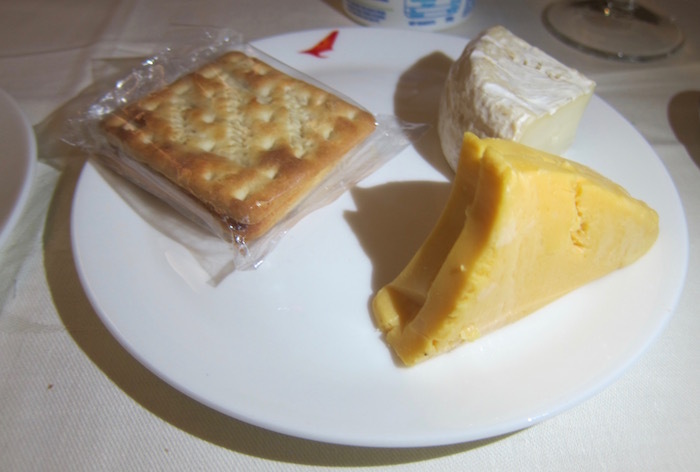 Airline food (no matter which airline including CX, SQ, ANA, etc.) is terrible. Better to pocket the money and have a wonderful meal elsewhere at a renowned restaurant. “Can ANA serve a good Indian meal??? Answer is NO. Actually, ANA serves good food, period, whether it’s Western or Japanese. If you think all they serve is sushi and/or that’s the only good thing they serve, then you really don’t know ANA. And while the occasional curry dish, Indian or non-Indian, served on ANA may not be as good as what you’d get on AI, most people would say it’s rather good. Overall, ANA does offer a superior product to AI, unless you absolutely cannot fly without eating Indian food. I’m not sure I understand the logic of your argument, to be honest. Based on what you are saying, people should only fly on airlines that cater to their ethnicity when it comes to language and menus? If that’s the case, then only Indian people should fly Air India. I do agree, though, and have said it before on here, UA screwed up when it didn’t take advantage of partnering with AI once AI joined Star Alliance. I’m scratching my head trying to figure what being gay has anything to do with this straight like an arrow report. Puh-leez! 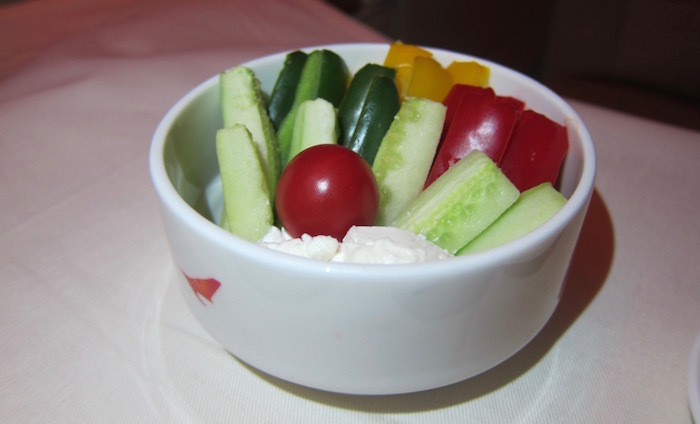 Commenting on airline food is just useless – everyone has different tastes. 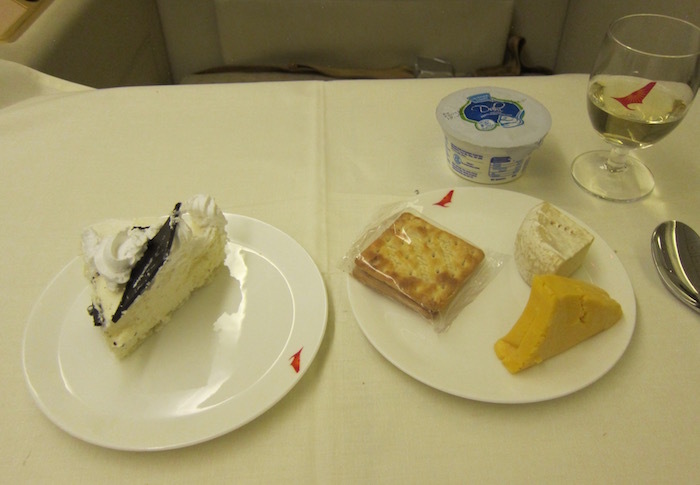 But the one consensus my mates and I have – airline food is what it is; don’t expect to be impressed. Save the space as Samantha mentions above and go dine at a nice restaurant upon arrival, if you are able to; otherwise, just try the little snacks, which are usually edible. 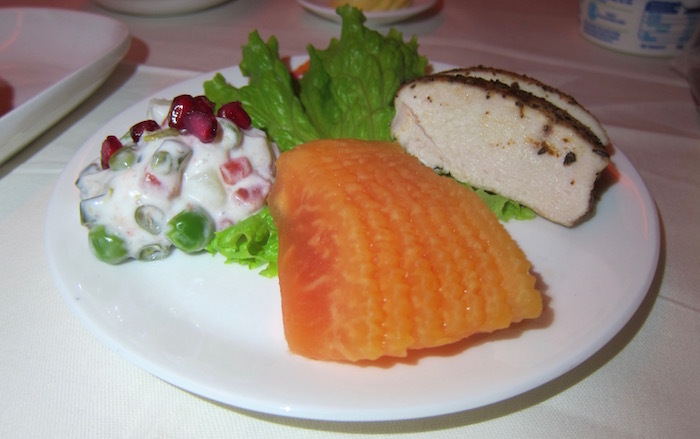 While eating at the Commander’s Palace in New Orleans or the Bukhara in Delhi may be a 10/10, most airline food is prolly 6/10 (perhaps 7/10 if at best). @Jared – call me. Need to figure out weekend travel plans. All I am saying airlines cater to their large audience, ANA my be good for for Western/Japanese premium passengers. But those audience are mostly irrelevant to AI’s DEL-SFO. There are 195 PAID Y class Indian passengers, that is $234,000 revenue at $1,200 each. If AI dumps F and adds 27 x Y that brings additional $32,400 without all this additional service. That is close to $66,000 profit without even counting J. By the way AI went great length to offer better food on DEL-SFO. “What is amusing is they did not seem to care about people having their seats reclined and being asleep before take off,…” They don’t appear to care if people are wearing seat belts on takeoff either.” – I dont know about which Indian airlines you have travelled but I have never been on a single flight here where the FAs do not make everyone wear a seat belt and get the seat upright, they check, recheck and just to ensure they checked correctly, they check the whole cabin again. Its weird though this flight was not like that. I am waiting for a resolution to slippergate. Are the red spots part of the fabric or a splatter stain? Ben, dang it, you should have asked for another pair. In a way, I understand what Indian is saying. 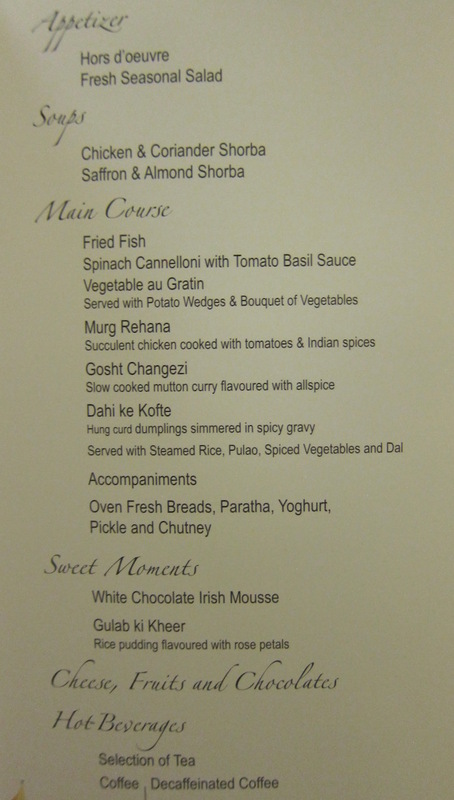 The airline caters to the Indian population, especially families so the food selection is tailored to match the paying demographics. However, it probably doesn’t hurt to have some variety in first and biz, just for kicks at least. Ultimately, I still prefer to food on AI F compared to most other airlines that flying that route direct from NA (mainly UA, AA and AC (only biz) now). Whether or not Indian cosumers prefers Indian food or whatever isn’t the point. Comparing AI to the US carriers is too easy since they, well, they’re not that good overall. The original point I was making is that comparing AI with comments like ‘Well, it still better than United!” is pointless, because, duh. You can still compare it to many other airlines, and is just not up to par with them. Hell, you can compare it to Jet Airways, which overall is a better airline. I believe AI has western food options available to premium pax. In case you haven’t noticed SQ is involved in AI operations every which way possible. AI want to learn from the best in *A. There is nothing to learn from UA/LH. UA/LH keeps AI away because of their superiority complex. UA/LH also keep SQ away, why? inferiority complex. LH keeps TK away because it is growing too big too fast. AC slowly moving away from losers like UA/LH. SQ,TK,AC and AI in another. So me comparing AI with UA is still valid, because it is a founding member. Any founding member would help junior member to improve their product and service. But UA has noting to offer. Again, all of which has nothing to do with comparing quality of the actual product. This isn’t about who helps who and if they all hold hands together while singing kumbaya. Instead of directly addressing quality, you seem to be trying to steer the conversation to other topics, like how Star Alliance is run or is in cliques which has nothing to do with the quality of the airlines themselves. You can compare AI with UA, sure, but then don’t be shocked if people compare it to SQ or TK or LH or NH or CX or JL…and just doesn’t compare favorably to them. After reading your report I had a big smile on my face as I had taken a similar flight the end of December 2015 on AI. BOM – EWR, 16 hours non stop in first, seat 1K and with the same lovely Havanda in charge of me. Seeing her pic brought back memories of the warmth and great hospitality, I enjoyed on that flight. It was due to her and her lovely colleagues that I was completely pampered and left with nothing to complain about. Being the only pax in First class with a crew of 4 just serving me, it was a fantastic flight. I found the schedule of service weird as you rightly put it so requested them to change it to help me adjust to New York Local time. 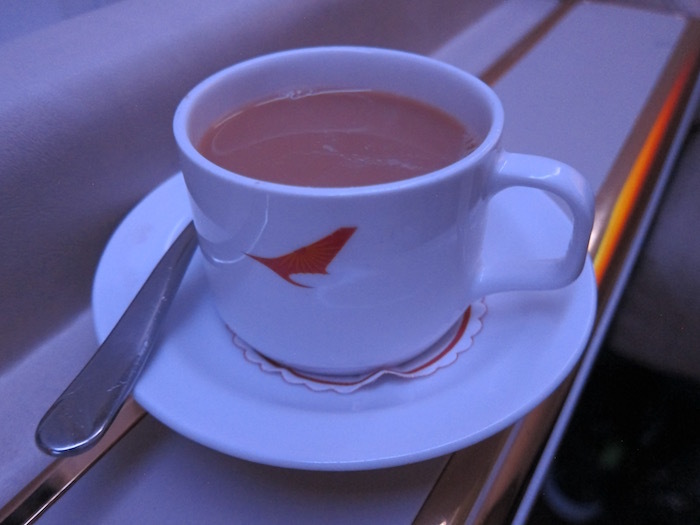 So I had the snack service after take off which was around 1:45 am and then after sipping some great single malts which were constantly refilled, I made them serve me dinner, which was actually their lunch service, then a wee bit of sleeping and just before we could land at 7 am local time I had breakfast. So they changed the entire order of service to suit me, which I truly appreciated. 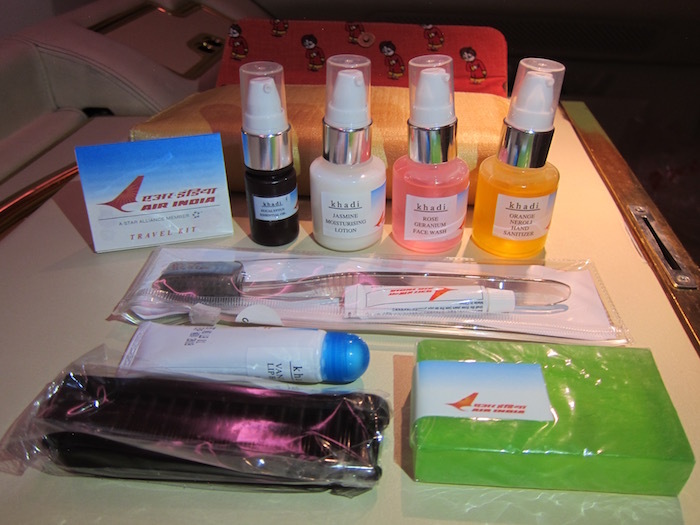 I did not get an amenity kit on that particular flight, no reason given for that. The bed was made for me in the adjacent seat, So I could sleep when I wanted to. I landed In Newark quite fresh. I had wanted to try their product in First since long and went with no expectations, so I really did not care much about the hard product, but was overwhelmed with the genuine warmth of the crew and the great tasting Indian food. It felt like home. And yeah the ground services at Mumbai airport are a class apart. Full marks for that. On landing in EWR, being the first pax off, I was greeted by another staff member with my name and escorted till I was out of the terminal. Are you suggesting no one here said “AI ain’t SQ/CX/NH”. There is also a suggestion “UA is ahead AI in same class of service, all things considered”. In fact when All things (F,J,Y on International and Domestic, catering, crew, home base) considered AI beats UA hands down. You may come across an indifferent FA on AI, never a Prozac laced FA ready to power trip. Of 28 *A members 26 signed comprehensive code shares with AI, only UA is the odd man out. AI wannabe SQ not UA. A great summary. Many areas are a given. AI may decide to increase Y seats and reduce F and C. It appears though that C sells out rather quickly on AI which inducates it is value for money a d a good choice of discerning passengers who value nonstop over 1 stop, given frredom to devise your own plan for inflight time, rather than deplane en route. 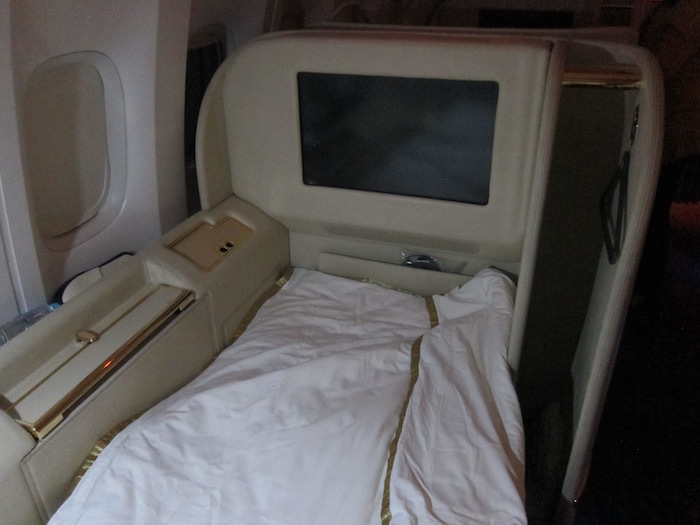 I would like to know if the DEL-SFO-DEL Air India flight has flat-bed (180 deg) seats in business class. I wanted you (Ben) to know about this. I didn’t know of any other means to get the info to you, hence a comment. I loved the duvet on AI, as on my other TG and UA J classes, I was given a polyester blancket which got extreemly static. 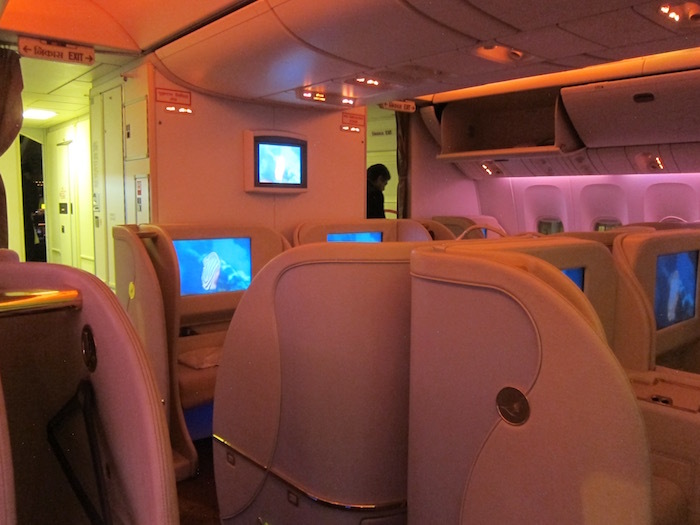 the BKK-BOM sector used a Brand new Dreamliner and the seat resembled the first class seat on your report. I would definitly give AI a 4.5 star out of 5 considering the Price /Product ratio. 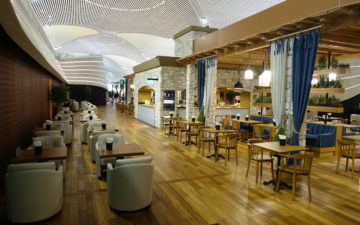 Also I must add the Business lounge in Mumbai air port was one of the best lounges I have ever been to. 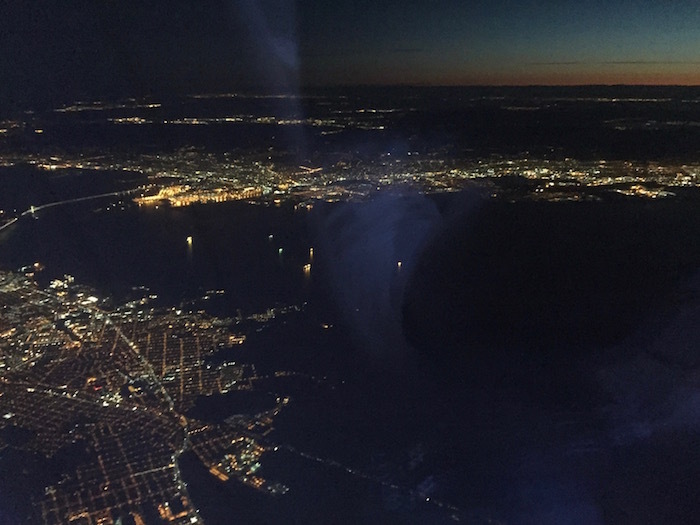 A nostalgic but excellent trip report from a blog I follow a lot – This guy has some awesome trip reports on airline not covered here. Any thoughts on Business Class experience SFO-DEL-BOM ? 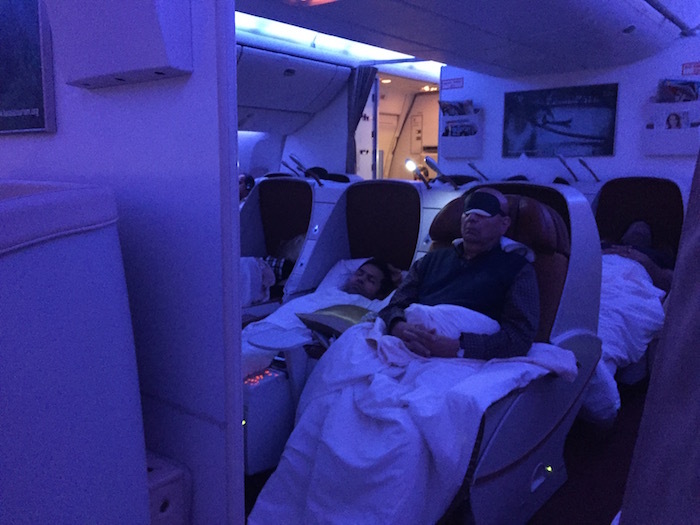 March 5, 2017 – I have a friend who just boarded the sfo – new delhi flight in business class. Here are the first comments from the plane. “Service is good. Carpet torn. Screw coming out of seat. Plane smells.” Come on Air India – you have the hardest part done (service). Fixing a plane is trivial. Get your act together and become a world class airline. Our company has a policy of the lowest fare airline, which means Air India. No one enjoys that, not even the Indians. Lucky probably lucked out on this flight. Some routes have slightly better aircraft, and Lucky was in First Class. Business and economy are another story altogether. As for the food, I can’t handle Indian food well, and after an extended trip in India, I want some comfort food. They don’t have any other menu options. On these trips, I carry meal replacement bars. It is all fake. No hygiene, no professionalism in staff, and a lots of flaw. The review is very fair and really detailed. The crew in the first class redeems the flight. 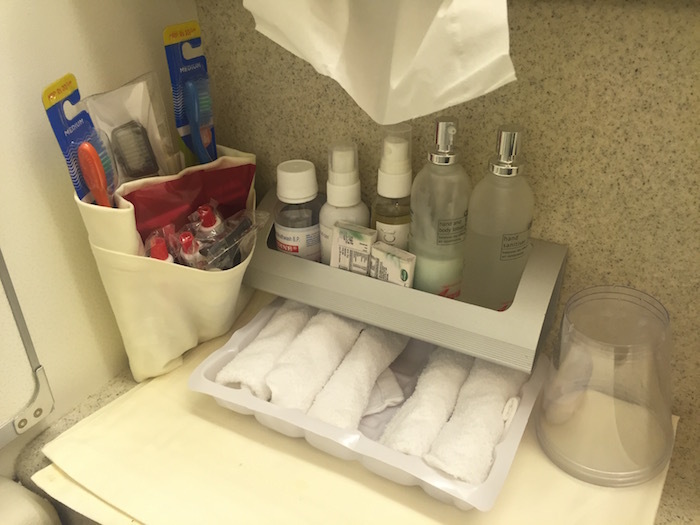 The toiletries, quality of the dinner service, overall look are all not comparable to the 1st class on other airlines but what AI lacks in poshness it makes up in sincerity. Liquor/liqueurs need improvement. I would recommend AI unhesitatingly if the price was significantly less than it’s other Star Alliance partners. I am happy to hear that some people like Air India. For my wife and I , we have flown by Air India from New York JFK to Mumbai (and back). After that, my wife told me that she would fly any airline except Air India. What really irritated her were flights leaving 15 hours late, with no explanation. That happened inbound to India from JFK, and outbound out of Mumbai back to JFK. They simply would not answer when queried about the delay. They just left us in-limbo in the transit area of the airport, along with all of the other transit passengers. Also, it is worth noting that the Air India Check-In crew in Mumbai were difficult to deal with with my wife. They were harassing her about her US Passport (which says place of birth is Vietnam). It took me introducing myself (I am an American of Indian background–born in Chicago) before the person backed off and let us through to the jet. 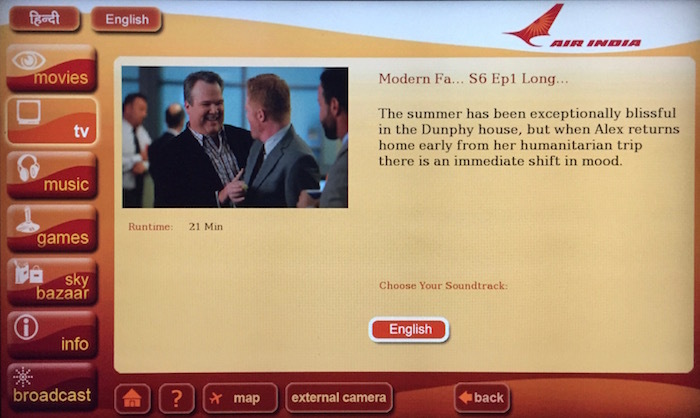 I do not want to trash Air India, but this is an experience that left a bad taste in my wife’s mouth, and she was a first time customer of Air India. She told me no more after this.